The Quake node lets you create a very common camera move, the camera shake. Using the Quake node, you can generate an automated quake instead of manually entering random keyframes. This way, you can simulate the shock of something heavy falling on the ground, like an earthquake or a strong vibration. From the Node Library view, drag a Quake node to the Node view. 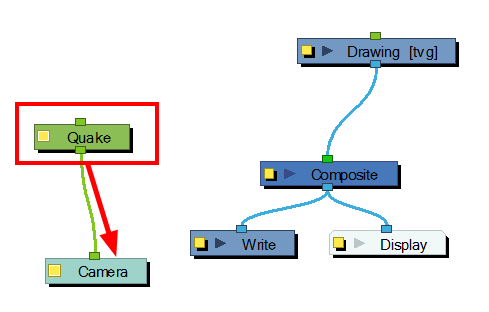 If you do not have a Camera node already, drag one from the Node Library view to the Node view. Connect the Quake node to the Camera node. 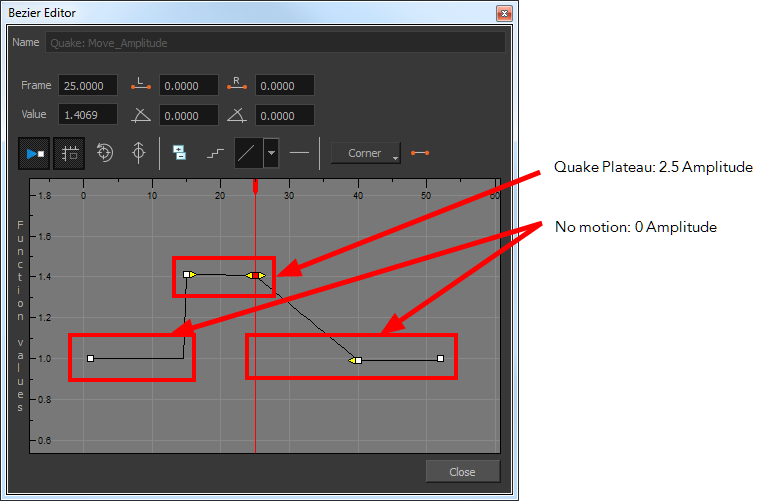 Click on the Quake node's yellow square properties button to open the Quake properties. In the Quake properties window, adjust the properties. 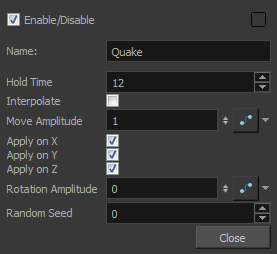 Hold Time Lets you enter the number of frames you want one of the quake vibrations (position) to hold for. Most camera shakes are done in a single frame (1) or double frame (2). Interpolate An interpolation is generated between the random values. Instead of jumping to the next position, it will slowly progress forwards to the next position. It is the same principle as stop-motion keyframes and motion keyframes. Move Amplitude This is the strength of the quake. The higher the value, the stronger the quake. If the value is set to 0, there will be no motion. To have the motion start and stop at a specific frame during the scene, you can create a function curve and animate the amplitude over time. Simply click the Function button to generate the function, then click on it again to open the Function editor. Apply on X, Y, Z Applies the quake to the X, Y and Z-axis. Rotation Amplitude When the value is higher than 0, a rotating quake is applied. The higher the value, the stronger the quake. Random Seed Generates a different randomization pattern. 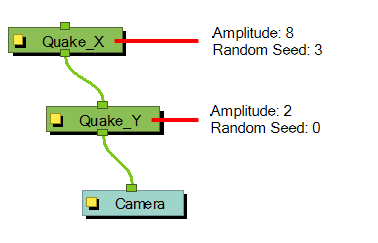 If you cascade two Quake nodes or more to apply a different amplitude on a different axis, you can change the Random Seed value to generate a different randomization pattern. If the X quake has a strong amplitude and the Y quake a weak amplitude and you do not want them to follow the same random pattern, then set the Random Seed value of the Quake nodes to different numbers.